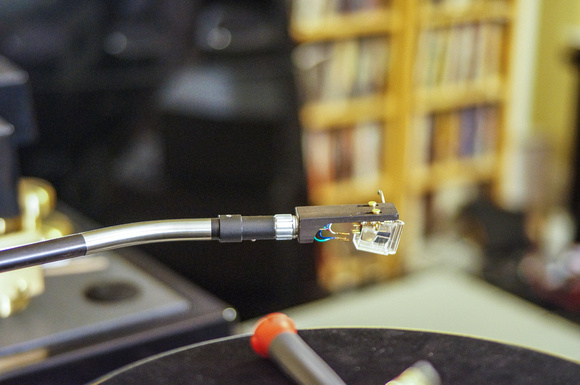 Because it is a thing of beauty to witness and because the results make such a huge difference in the sonic presentation, I’d like to take you through the process of mounting, aligning, and optimizing a moving-coil phono cartridge the way an expert does it. That expert is my friend and colleague Andre Jennings. Although I am capable of handling several of these chores on my own, I generally leave the fine-tuning to Andre. 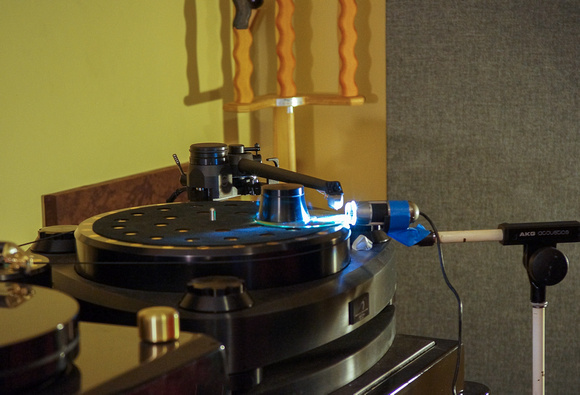 He's had experience with just about every cartridge and tonearm currently on the market (as well as many that are no longer marketed), and has set up cartridges and tonearms for friends and colleagues throughout the Midwest, for distributors nationwide, and for manufacturers at trade shows. His expertise is, IMO, unrivaled. The photos I’ve taken of Andre's work actually involve the setup of two different cartridges in two different tonearms—the Goldfinger Statement in the DaVinci Master Reference Virtu tonearm and the Ortofon MC Anna in the Kuzma 4Point tonearm. Like old age, cartridge setup—done right—is not for sissies. It is an arduous, painstaking process that requires nerves of steel and infinite patience. If, like me, you tend towards clumsiness or near-panicky fits of pique when handling very small, very delicate items, you would be well-advised to leave cartridge setup to an expert like Andre—or to an analog maven or a retailer with a good deal of experience in the field. The cartridges being installed here are anything but cheap—$8500 (Anna) to $15,000 (Statement)—and getting fed up and doing something careless or stupid while handling them can end up costing you a lot of money. Before alignment Andre snugs the screws down but doesn’t fully tighten them, as the cartridge will need to be moved forward and back in the headshell and twisted slightly side-to-side to achieve proper alignment. Step two is attaching the tonearm leads to the output pins at the back of the cartridge. Although I’m not showing you the process—just the result—this is (or, at least, can be) a tricky little step, depending on how handy you are. You have to use the right tool for this job and fingers aren’t it. You’ll need tweezers or small needle-nose pliers to do it right—and you’ll still have to be careful! The stylus of a cartridge, like the Goldfinger Statement here illustrated, is completely unprotected by the cartridge body—sticking out in front of it like a tiny invitation to disaster. If you seek to gain leverage while attaching the clamps of the color-coded tonearm leads to the (usually) color-coded cartridge pins by putting a finger on the front or side of the cartridge, you may very well bump that stylus with some force if your finger slips, and, folks, take it from someone who knows: You do not want to hit the stylus of a Goldfinger Statement (or any cartridge, for that matter) with your finger. Keeping the stylus guard on the cartridge when attaching the leads is the safest procedure, and what Andre has done here. 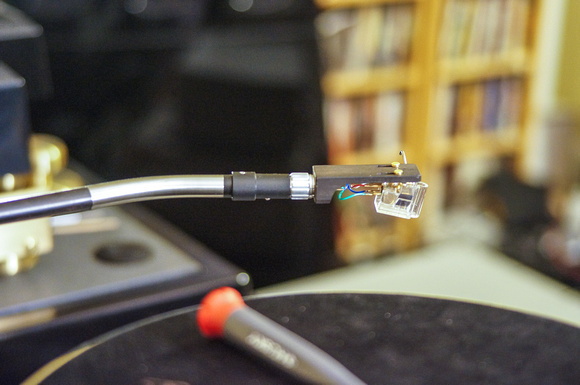 If you’re attaching a cartridge to a tonearm for the first time or switching cartridges, you may find that the clamps at the ends of the tonearm leads are too tight or too loose to fit snugly on the cartridge pins. Don’t force anything! The clamps may need to be slightly enlarged or slightly narrowed prior to attachment. You can do the former by inserting a toothpick into the clamp, opening the gap up a wee bit; to close it down some, use your needle-nose pliers, but use those pliers gently and sparingly! The clamps at the end of tonearm leads can only stand a little bit of strain. If you pull them or twist them or abuse them repeatedly, chances are they will break off, making it necessary to solder them to the tonearm leads again (a job you don’t want to do). Step three is setting VTF (vertical tracking force). 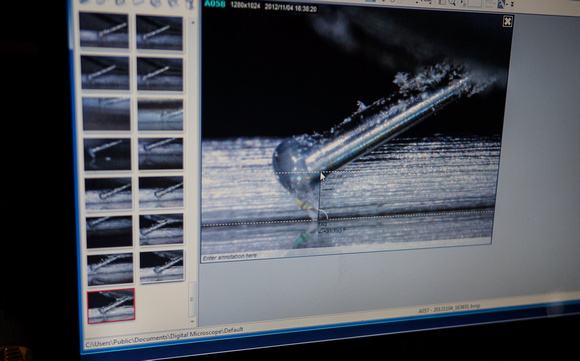 You need to do this before alignment, but you don’t have to get VTF exactly right at this point—just in the ballpark of the manufacturer’s recommendation. 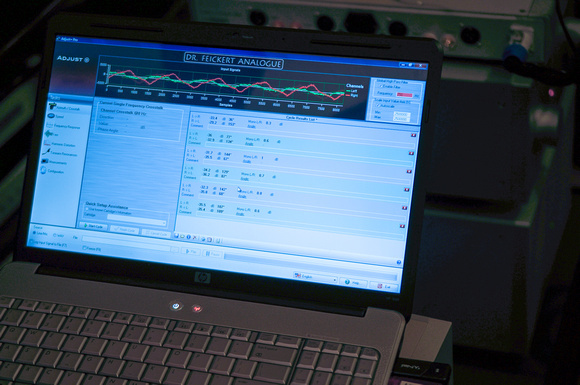 You will need to check VTF again in any event after alignment and other adjustments have been made—and later by ear. There are several digital stylus-force gauges on the market; if you’re heavily into analog I would recommend purchasing one of them. They are more precise than Shure’s mechanical gauge, although be aware that some of them are affected by a cartridge’s magnetic field. You can tell if you’ve got one of these if the VTF reading changes to any value other than 0.000 as you prepare to lower (or actually lower) the cartridge onto the gauge. If your meter does fluctuate as you position the cartridge above the gauge’s measuring platform, stop and press the TARE button. This should zero-out the meter, after which you can continue lowering the cartridge onto the measuring platform. 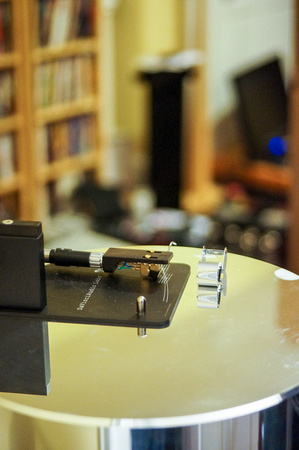 Step four is attaching an alignment jig to your turntable/tonearm. Once again, there are many of these on the market from freebies on the Internet, to protractor-style jigs like the custom-made one from Dr. Feickert that comes with the DaVinci Virtu tonearm, to engraved-mirror ones from Wally Tractor, to the dedicated paper or plastic graphs and other devices invariably supplied with tonearms. I’m not going to go into the science behind alignment. Suffice it to say, that a cartridge in a pivoted arm is only exactly in the right position (in perfect tangency with the groovewalls) at two points in its arc of travel. Everywhere else it is slightly out of perfect tangency. A straight-line-tracking tonearm, OTOH, is always in perfect tangency vis-à-vis the groovewalls. However, neither a pivoted nor a linear-tracking tonearm will be “right” if it is not properly aligned to begin with. Basically, alignment is a two-part process: 1) setting overhang, and 2) aligning the stylus. The first is accomplished by moving the cartridge back and forth in the headshell (toward and away from the tonearm pivot point) so that the stylus fits precisely in the pinprick engraved on your protractor at one or two specified points in its arc of travel (or, with a straight-line tonearm remains in the groove of your protractor throughout its entire line of travel). 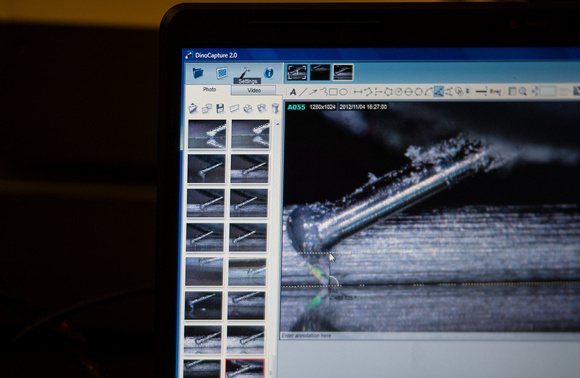 Stylus alignment is accomplished by twisting the cartridge body so that it is perfectly “squared up” within the engraved rectangular grid surrounding the pinprick on your protractor (while the stylus tip is sitting in that pinprick), so that the stylus is not just sitting in precisely the right point(s) for proper overhang but is aligned so that it is squarely in that point and not at an angle to it. 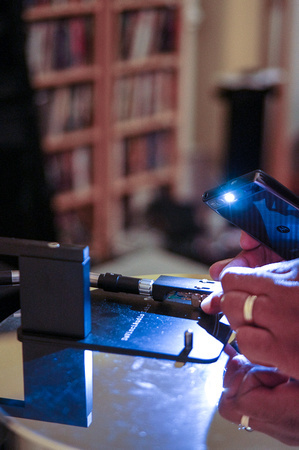 You can see Andre adjusting alignment in the photograph above; he is using a flashlight in his cellphone to illuminate the cartridge and the jig. 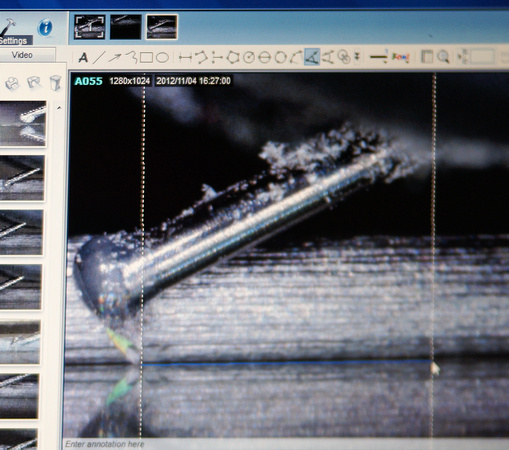 Precision cartridge alignment can be a tedious, time-consuming task, and it takes someone with a steady hand, a keen eye, a good deal of previous experience, and the patience of Job to do it accurately, safely, and thoroughly. Step five is setting stylus rake angle (SRA)—a variant of what we used to call setting VTA (vertical tracking angle) back in the day. ’Course, back in the day, we adjusted VTA solely by ear. Received wisdom was that it should generally be set so that the tonearm was parallel to or slightly below parallel to the LP’s surface. 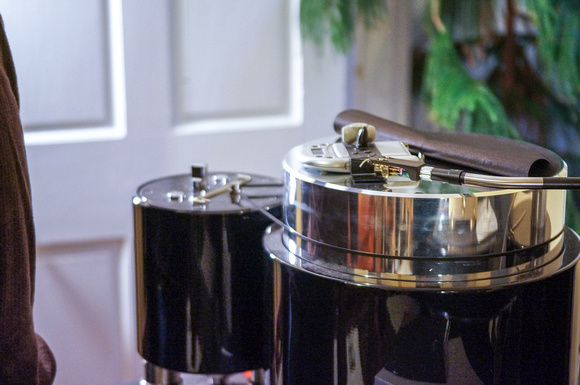 In practice, this always seemed to give you a richer, fuller sound with less treble bite, and in those days reducing treble bite was a good thing given the state of tonearms, moving-coil cartridges, and LPs (particularly Mercury LPs). However, it turns out this formula, for all its salubrious effects in listening, was technically incorrect. In March 1981, Jon M. Risch and Bruce R. Maier published an article in Audio magazine titled “More Than One Vertical Tracking Angle,” in which they pointed out that, in order to play back an LP properly, in theory the playback angle of the stylus ought to be the same as the angle of the stylus in the cutting head, and their research determined that the cutting angle was typically 92º (not the 90º or less that we had always assumed was right). The article didn’t have much effect until Michael Fremer, bless his analog heart, apparently rediscovered it. Since then there has been a bit of a mini-revolution in cartridge setup, in which measuring SRA and adjusting VTA to get SRA theoretically right—or close to right—have come to the fore. The process of measuring SRA is not for the weak of spirit. 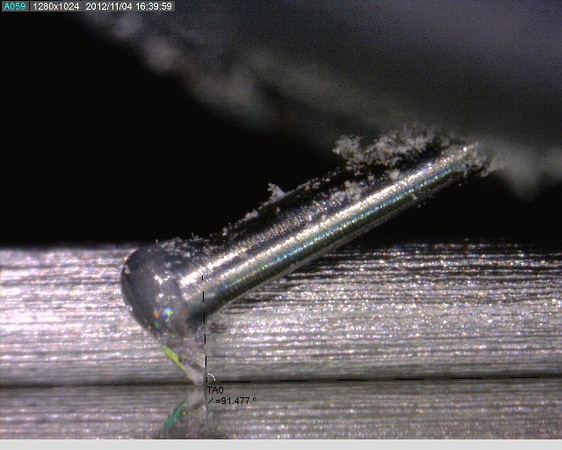 To do it you must have a digital microscopic camera, a stand to put it on, a computer with a good deal of processing power, and, as is the case with every aspect of cartridge setup, a dedicated tweaker’s spirit, nerve, and patience. 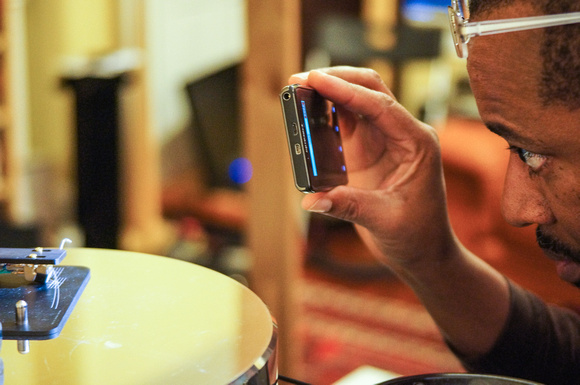 Pictured above you see one of Andre’s digital microscopic cameras, sitting beside an Acoustic Signature Ascona turntable with a Kuzma 4Point tonearm in which an Ortofon MC Anna has been mounted. The microscopic camera is a USB device that plugs into a laptop computer, whose screen you will see shortly. What it does—once you get the stylus in precise focus (a process I literally couldn’t stand to do on my own)—is take a close-up picture, like the one below this paragraph, of the stylus sitting on a perfectly flat surface with, in this case, a cylinder of pencil lead, which also must be focused, sitting behind it to provide a flat horizon line. Software, which comes with the camera, allows you to rotate two spaced lines, one of which is adjusted so that it is parallel to the stylus, from a position perpendicular to the record surface to a position parallel to the record surface (see below). 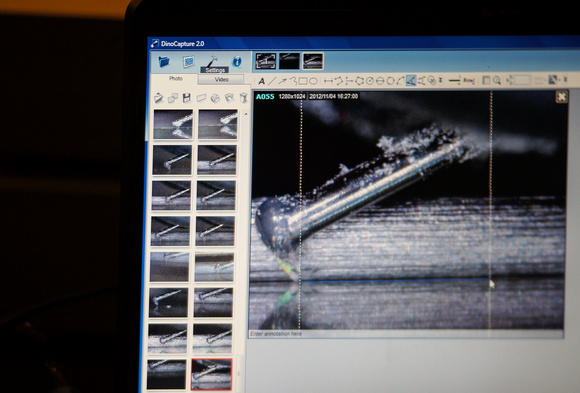 The computer then calculates the stylus rake angle (symbolized by the little white curve running from the black line at the back edge of the stylus to the flat surface the stylus is sitting on). In this case the measured SRA was 89.725º. To adjust SRA for theoretical correctness, you then raise (or lower, depending on your reading) VTA until the SRA (which must be measured again—often repeatedly) is somewhere between 91º and 92º. (The slop built into this setting allows you to season by ear and by typical record thickness.) In the screenshot below, you see that SRA has been adjusted, by raising the back of the tonearm, to a closer-to-theoretically-correct 91.477º (which is where I liked it best). The upshot of this SRA business is that the received wisdom of the past was wrong. 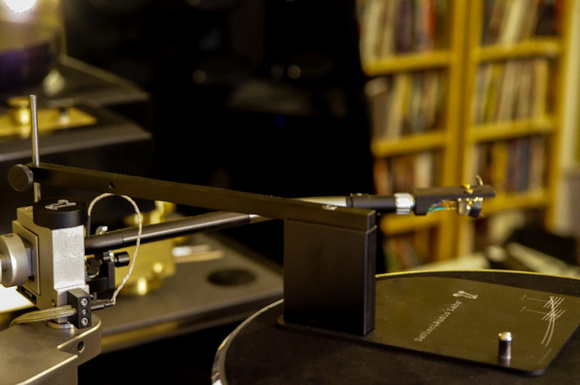 To get theoretically correct SRA, a tonearm should usually be raised above parallel to the record surface (sometimes a good deal above parallel). Of course, your ears must be the judges in this matter (as in all things audio). My own experience has been that a setting of 92º doesn’t always “sound” best. (Andre agrees and typically aims for an SRA of 91º to 91.5º.) Whatever SRA you ultimately decide on, be assured that getting rake angle right (or right for you) has profound effects on every aspect of the presentation--from overall balance to resolution, dynamics, staging, and imaging. Step six of Andre’s setup is adjusting azimuth. There has been a lot of nonsense written about azimuth—some of it, alas, in the pages of TAS. Trust me: Azimuth matters, and getting it right doesn’t just confer a theoretical advantage; you can readily hear the difference (as you can with SRA). Unfortunately, getting it right isn’t easy. 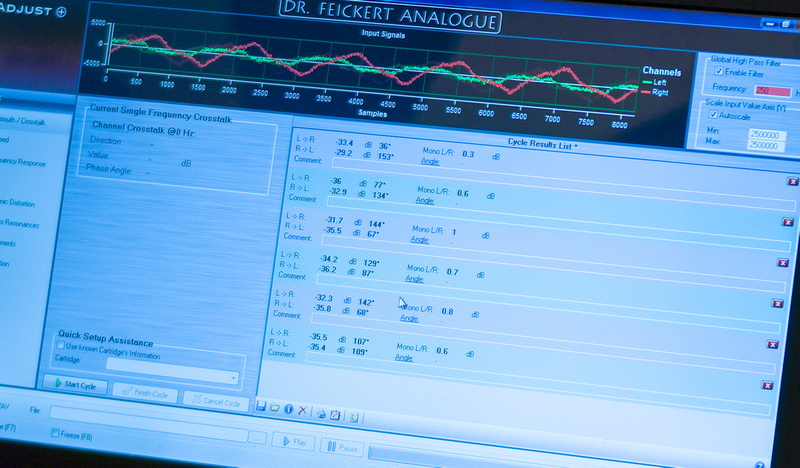 Once again, you’re going to need a computer and, to do it properly, Dr. Feickert’s wonderful software program, Adjust+. 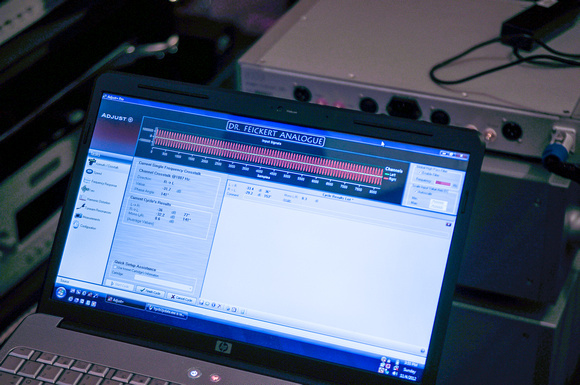 Adjust+ is actually a suite of programs that permits the precise measurement of all sorts of things, from turntable speed to (as you will see) harmonic distortion. But its foremost use is setting azimuth with high precision. 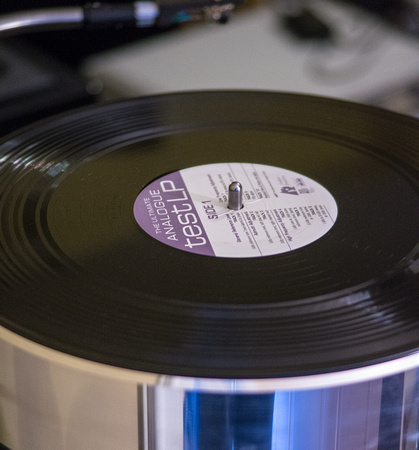 To use it you have to have a test LP (one comes with the software, although Andre prefers to use The Ultimate Analog Test LP from Analog Productions). Here’s the drill: Before playing back 1kHz (mono) reference tones for the left and right channel (tracks one, two, and three of TUATLP), you route the signal from the outputs of your phonostage via a (supplied) RCA-to-3.5mm-jack cable to your computer’s mike input. (Andre actually uses a sophisticated outboard USB converter.) Adjust+ then measures (in real time) the mono output of the left and right channels of your cartridge, calculating average left-to-right and right-to-left separation (crosstalk) in dBs. Without azimuth adjustment, neither Andre nor I have ever seen a cartridge that measures the same (or even close to the same) channel separation in both the left and right channels. Below, you can see the initial test we ran of the Goldfinger Statement cartridge, adjusted by eye and mirror so that it “looked” as it azimuth were correct. Channel separation in this “eye-balled” setup measured -33.4dB L-to-R and -29.2dB R-to-L. Now, folks, that is better than a 3dB difference in crosstalk—from what “looked” like a fairly correct alignment! It should go without saying that imaging and soundstaging would be audibly affected by this setup, and so would timbre. You probably won’t be able to see this on your screen, but the final crosstalk measurements show -35.5dB L-to-R and -35.4dB R-to-L. Now, these aren’t just sterling numbers (although they are that); the results are instantly and dramatically audible in playback. Although it takes considerable expertise, getting everything just right in cartridge setup—as Andre does—has a tremendous effect on the overall sound. Those who dismiss analog as a form of nostalgia simply haven’t ever heard a great turntable, tonearm, and cartridge set up by a genuine expert. Thanks to Andre I have (on many occasions), and I’m here to tell you that, IMO, hi-fi playback doesn’t get better than this.